Life is a funny animal, to be sure. Today I received three copies of Diderot's Lettre sur les aveugles (An Essay on Blindness, 1749), a book which led to his imprisonment for three months for questioning God's existence. 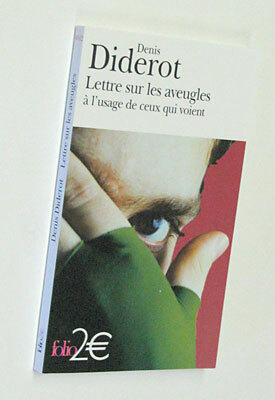 The books were sent to me by the fine people at Editions Gallimard because my picture is on the cover. (You can purchase a copy at Amazon.fr. )No, I'm not without sight. No, I am not French, nor a Diderot scholar. My picture was taken by renowned Seattle photographer Natalie Fobes for the 24 Hours in Cyberspace project back in 1996. The Web site for that project is ironically dead and gone. She licenses her photos through Corbis (see image NF117633), and Editions Gallimard purchased those rights. But either due to European law or custom, or Corbis's restrictions, they very nicely asked for my permission to use the photo. I said yes. So now Francophones will associate my left eyeball and eyebrow with Diderot.